There are several reasons for why Screen recording is an effective handy feature, but in the context of our article, we'll concentrate on its main benefit. It is so much helpful when remote tech support is necessary. What's more, if you have a busy schedule, you won't need to speak to other people and explain simple things to them for ages. Screen recording with iOS 11 will surely help. If it is not enabled on your iPhone yet, visit 'Settings', go to 'Control center', hit 'Customize controls' and choose 'Screen recording'. From this point, it is easier than it can seem. Just pull up Control center, capture the zone you need and share it from the Photos application. An alternative option is when someone has troubles with some issue and can't explain properly what's wrong. In this situation, they can screen record their troubles and send it to you. It will be more comfortable for you to work this way as sometimes people can't tell what is going on in details. Just imagine the work of buddies in tech support when they try to find a solution, but client's story is mixed. I also want to share a couple of tips with you. Better turn on the AirPlane or Do not disturb mode, as push notifications recorded on video may be annoying. These mods will guarantee a clear video without any interruptions. Another tip is paying attention to your status bar. If you want to screen a video for the further downloading it to YouTube, check if your battery is full and the signal is strong. It is done just for aesthetics. Who knows, maybe you'll use this instruction in your personal blog or in social media. If you think that screen recording may be uncomfortable, and you want to see the problem live, use FaceTime to help your friend or relative on short notice. An ideal situation is when a person who needs help has one more iOS device to use. It will make the picture clearer. It is necessary to watch how that person should adjust how to interact, tap, navigate their device. This way may be useful for working with Apple TV support. It is also great to use an adjustable tripod or a special stand to keep the device with FaceTime on steady. Check whether it stands at the correct angle. If you don't have one, it is not a problem to find it on Amazon. I must note it's a very handy thing. Providing tech support to people can be even easier when you get to control of their Apple devices. 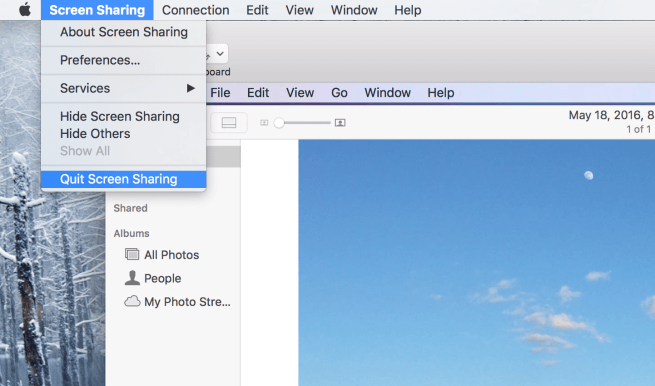 Macs and MacBooks have built-in screen sharing feature. Additionally, you can switch viewing someone's screen to sharing yours. To perform this, visit 'System preferences', go to 'Sharing' and ensure that the box named 'Screen sharing' is checked. What's more, ask the person who needs help whether his Apple ID he uses for Messages and iCloud is different. If they are, you should have both emails in your contacts on the Mac. 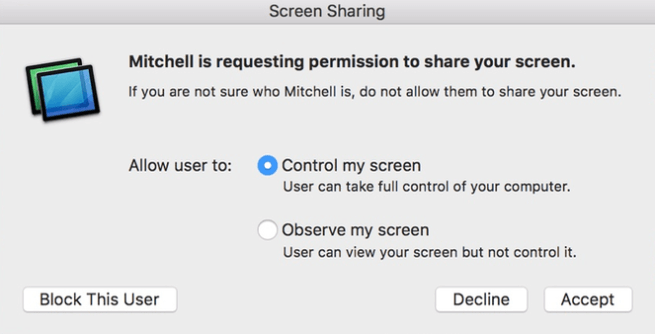 Go to Spotlight and search for 'Screen sharing', run it. A new dialog box will appear. Enter the ID of someone you want to share your screen video with. Don't forget to tell them to select the 'Control my screen' option. 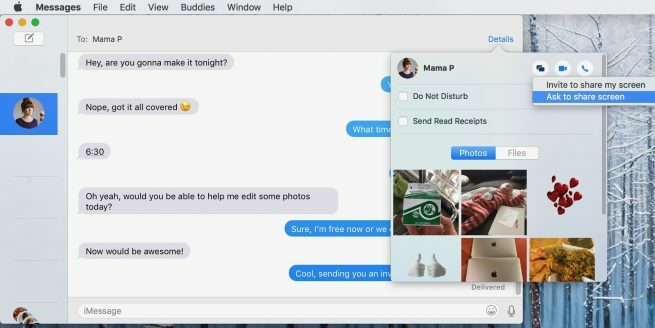 One more way to start sharing your screen is using the Messages app on MacOS. Go to 'Details' at the top. It is in the right corner of the window. Tap 'Invite to share my screen' or the 'Ask to share screen' option. Your choice depends on your specific needs. After you connect, a FaceTime call will also start and will last during the process of the screen sharing. Another way to deal with this task is opening QuickTime and starting a screen recording. Head to 'File', choose the 'New screen recording' option. After you record your instructions, other people will be able to watch them anytime it will be comfortable for them. When you finish the session, tap the 'Screen sharing' menu next to the Apple icon in the menu, and choose 'Quit screen sharing'. 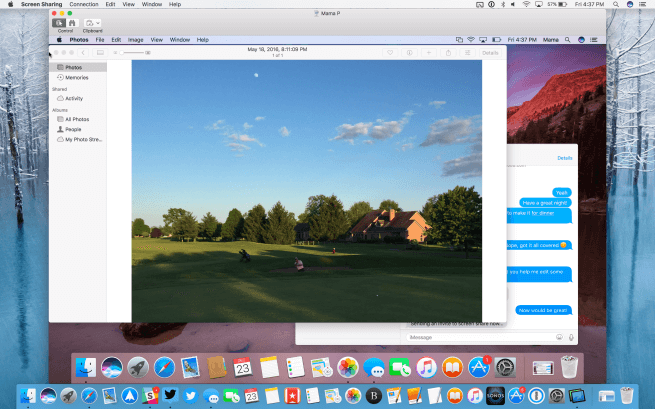 In case the built-in MacOS screen sharing process is not very comfortable for you, or you need to show something on a Windows PC or Chromebook, use some other software like TeamViewer. It is free for the personal use. There are also paid alternatives with 14-day free trials such as LogMeIn's GoToMeeting.